i can *finally* scratch “build cedar window boxes” off the to-do list. 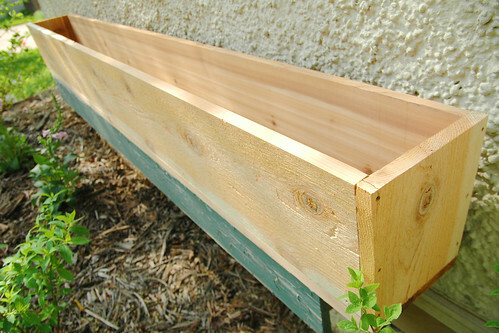 they are simple boxes made similar to what’s shown in this martha stewart cedar window box how-to. i used three 1″x10″ cedar boards with 2 1″x1″ cedar “cleats”, which hold the front and back and sides, drilled and glued to the bottom board. i trimmed the bottom board to 8″ wide so i could flare out the front of the box to give it a little more style that a simple rectangle. i suppose i could fancy them up with some trim at some point. Previous Postthe clean-up at organic valley headquarters is under way.Next Postso which is grosser – the inside of a handbag or ice at a fast food restaurant?